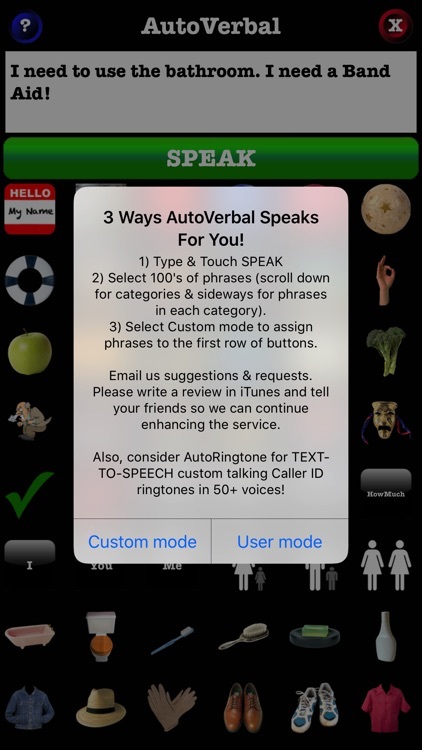 3 ways to speak: (1) 100's of built-in phrases in over a dozen categories (2) Program several buttons to speak your CUSTOM messages such as your name, address, family, etc. 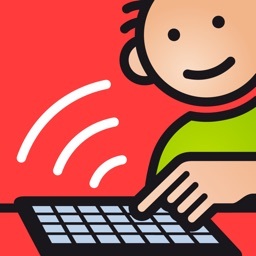 (3) Type ANY message and have it spoken using TEXT-TO-SPEECH! Empower yourself or people with Autism & Non-Verbal patients you care for! One price for iPad, iPhone & iPod touch! Elegant interface, quality recognizable images & customizations allow for quick & easy communication! Very affordable! Don't pay hundreds out of pocket or worry about Medicare or rationing devices. 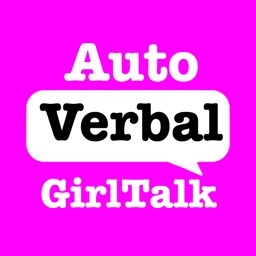 Everyone can have AutoVerbal! - iPad, iPhone & iPod touch universal support! Pay one price! - Users/caregivers can customize the TTS phrases for the first row of buttons by touching HELP to enter CUSTOM MODE! - 100's of buttons use Premium TTS voice, prerecorded, even when the Internet is not available! - Custom TTS phrases use Premium voice when Internet is available, Standard built-in voice otherwise. 1) Type anything in the text box and touch SPEAK to have it spoken! 2) Swipe up and down to see different categories of phrases. Swipe left and right within a category to see phrase options. Touch the phrase that fits. 3) In Landscape Mode, there is a TRANSCRIPT BOX. It remembers the most recent words/phrases you entered or selected. Touch it to have those words spoken! 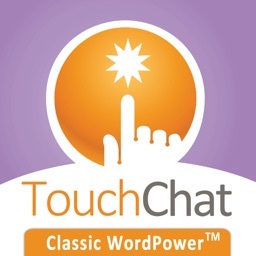 This allows you to build sentences or repeat a phrase easily. Touch the ERASER button next to the TRANSCRIPT to clear the transcript. 4) The TOP ROW/CATEGORY is customizable. 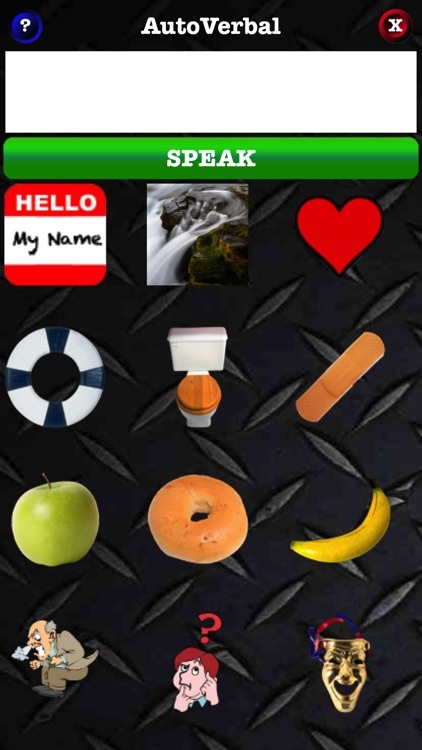 You can customize the text for each button, and with the PRO version, the photos for those buttons. To do so, first touch HELP then select Custom mode. Next select a button, replace the text shown ("Customize" by default) with your custom text and touch Save Phrase. To replace a button with a photo from your library (PRO VERSION), while in Custom mode, touch the button then touch the larger version of the button and select a photo from your library. 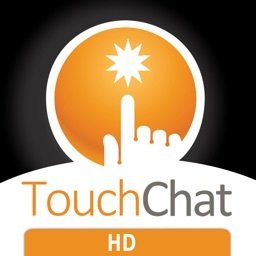 Touch HELP and User mode to return to user mode. NOTE: If you do not hear any sounds, make sure your Volume is all the way up AND you do not have your MUTE switch set. That is the toggle button above the volume buttons and it applies to apps as well as phone calls. Please email us at [email protected] with your feature requests including any phrases which we will be happy to add to FREE updates. Watch for more phrases/features! "[Esteemed NZ musician Chris Knox] had a stroke last year. I bought Chris an iPad specifically because of your AutoVerbal app. I try to get him to use it when he is having trouble expressing what he is trying to get across as he has almost no speech. There is potential for this to be a long term major tool to help him. Thanks again, you are doing good work." AutoVerbal GuyTalk uses a Male voice. 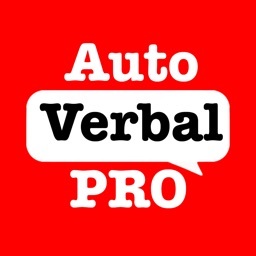 Try AutoVerbal PRO for Male and Female voices. PRO also lets you customize the photos for the top row of buttons! Look for AutoVerbal in multiple languages.